The first part of preparing to camp with your children is actually getting them to the destination. 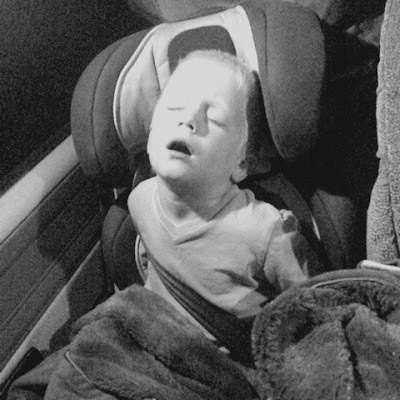 Long road trips strike fear into the hearts of many parents. And I don't blame them. Being locked in the car with a screaming, angry, bored little person is terrible (second only to being stuck on an airplane with an upset toddler.) But a little advanced planning can go a long way. I am fortunate in that my kids really are great travelers. I'm not sure if it's their personalities (and I just got lucky), or if it's because they are used to traveling. Both our boys took their first 400 mile road trip at 5 weeks old, and we haven't looked back since. However, at the start of every journey I still get nervous - particularly with a little one Parker's age. I've found that from crawling until about two-and-a-half years is the most difficult age to travel with. They're not yet entertained by electronics (usually), you can't reason with them whatsoever, and they communicate through screams rather than words. Therefore, most of my prep this trip was for Parker. 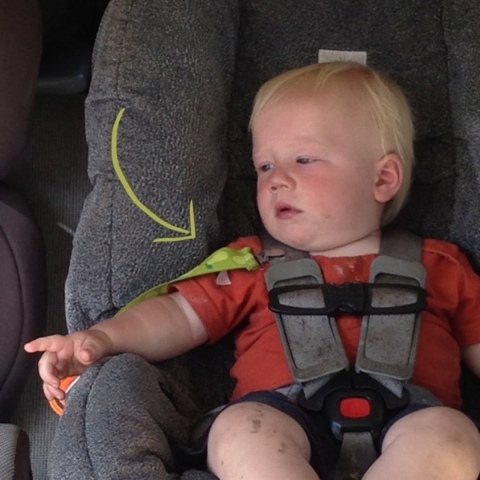 I started with pinning Parker's pacifier to his carseat. That way a) He couldn't throw it and b) it never got lost. Next, using a variety of Pinterest pins I created a special Toy Box for the car. It mostly included activities for Parker, but I threw a few in for Landon as well. The box also doubled-up as our toy box for camping. It's important to have a few toys to play in at the campsite as well. - And old wallet stuffed with business cards, photographs, old gift cards, etc. Additionally, both boys were dressed in loose comfortable clothing. I always bring a blanket to cover them with because they will sleep longer if they're really warm. And obviously the car is filled with snacks and beverages. RJ and I also have the whole drive somewhat strategized. We usually leave at nap time guaranteeing the kids will usually sleep the first hour or two. Then, once awake, the kids are forced to just sit there with no activities for as long as they (or us) can take it. Once we agree to open the backpack/activity box we start with the less interesting stuff and move towards the more interesting stuff (you don't want to throw our the best stuff first!). We usually buy them special treats at gas station stops, and, when everyone is their most cranky we pump up the music and have awesome car dance parties. What's on your road-trip survival guide? I would love to hear your tips and tricks too. "you can't reason with them whatsoever" Isn't that the worst?!? I have to say, for us we have found traveling in the middle of the night to be the worst. Both times we tried it, both kids happily (well, actually not happy at all) stayed up until we reached our destination (2-3am). Never again for us. But for some reason, nap time works great for us. We do most of the same things as you guys do. Also, our kids love it if I read to them when we drive. I can only handle it for so long, but it works when need be.